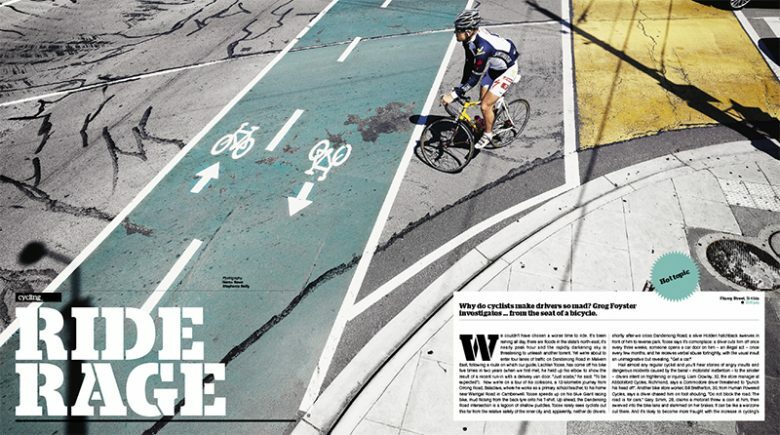 Hail almost any regular cyclist and you’ll hear stories of angry insults and dangerous incidents caused by the banal – motorists’ inattention – to the sinister – drivers intent on frightening or injuring. Liam Crowley, 32, the store manager at Abbotsford Cycles, Richmond, says a Commodore driver threatened to “punch his head off”. Another bike store worker, Bill Bretherton, 30, from Human Powered Cycles, says a driver chased him on foot shouting, “Do not block the road. The road is for cars.” Gary Simm, 28, claims a motorist threw a coin at him, then swerved into the bike lane and slammed on her brakes. It can be like a war zone out there. And it’s likely to become more fraught with the increase in cycling’s popularity: the number of people riding to work rose by almost 50 per cent between 2001 and 2006, and Bicycle Victoria’s annual counts show a steady surge since. Commuter cycling is most popular in inner northern suburbs (City of Moreland and City of Yarra) and bayside areas (City of Port Phillip). Infrastructure appears to be the main reason for the increase – Melbourne’s bike path network nearly doubled in length between 2000 and 2008. Laws forcing new buildings to have bicycle parking, lockers and showers have also played a part. Melbourne is now Australia’s cycling capital, with the bicycle share of trips twice as high as in Sydney. But we’re still a long stretch from Copenhagen, where more than a third of people commute by bike, and our surge in cycling hasn’t been a smooth ride. As early as 2005, two-thirds of Bicycle Victoria members surveyed said they had experienced on-road harassment in the past year, averaging one incident a fortnight. The conflict spiked in the media in 2006 with the death of James Gould, an elderly man who died after he was hit by a bicycle when the notorious “Hell Ride” cycling group surged through a red light at a crossing; and there are regular reports of incidents usually involving cyclists on the receiving end. Cycling researcher Dr Jan Garrard, a senior lecturer at Deakin University’s School of Health and Social Development, suggests harassment of cyclists is widespread and largely condoned. “It’s a form of aggression that’s sanctioned because we have a dominant car culture.” Over the years, Garrard, a cyclist herself, has had an assortment of things thrown at her while riding, including a boomerang. “It didn’t go back,” she says, laughing. Why do some drivers get so angry with cyclists? “I think the underlying factor is that they are a minority group,” she says, citing a UK study that showed drivers see cyclists as an “out group” and find their behaviour more annoying than that of other drivers. We take to our bicycles and serendipitously meet two police officers riding along the Beaconsfield Parade bike path. “We get a lot of complaints at the station, a lot of road rage,” says Senior Constable Georgia White, resting on the handlebars of her blue mountain bike. “The motorists are getting angry with the cyclists because they are taking up a lane, which they are entitled to do.” As she speaks, Lycra-clad cyclists whiz past, riding two abreast. The officers say this is legal, though many drivers think it isn’t. Some other largely unknown or ignored rules: cyclists receive the same penalties as drivers for running red lights ($299) and drivers and passengers can be fined for opening car doors on cyclists ($119). The penalty for not wearing a helmet recently increased to $149. “A lot of complaints are due to a lack of education between both cyclists and motorists,” says Senior Constable Damien Vallas. In the CBD, we hear drivers’ complaints firsthand. Interviewed outside car parks, they tell us cyclists run red lights, can be “unpredictable” and “think they own the road”. Once we start looking for rule-breaking cyclists, they’re everywhere. Here’s a sample from a single commute: at 7.50am a cyclist rides diagonally across Gisborne Street, near St Vincent’s Hospital, in front of oncoming traffic; at 8.16am a cyclist runs a red light on St Kilda Road; at 8.44am, a cyclist rides the wrong way down a service lane on the Nepean Highway, then illegally enters an intersection. Yet drivers are hardly blameless; indeed, some simply refuse to share the road. 8.02am. A taxi blocks the bike lane on Macarthur Street, forcing a cyclist to veer into traffic. 8.03am. A ute swerves left in front of a cyclist at the top end of Collins Street. 11.42pm. A silver Toyota pulls in front of me on Brunswick Street, Fitzroy, without looking. A 2010 study from Monash University and the Amy Gillett Foundation found drivers were at fault in 87 per cent of incidents with cyclists. So if drivers are often at fault for incidents, why do they get so aggressive? It’s not just that cyclists break the rules. A 2005 Victorian inquiry found that “the simple act of riding on the road” was enough to trigger violence from drivers.